I don’t know about you, but I’ve been eating my feelings lately. Ever since what’s-his-face won the election last fall, I’ve been drowning my liberal-leaning tears in all manner of comfort food. Over-eating as a consolation prize ain’t much, but that’s all I’ve got these days… that, and toddler cuddles. Both simple pleasures are appreciated. 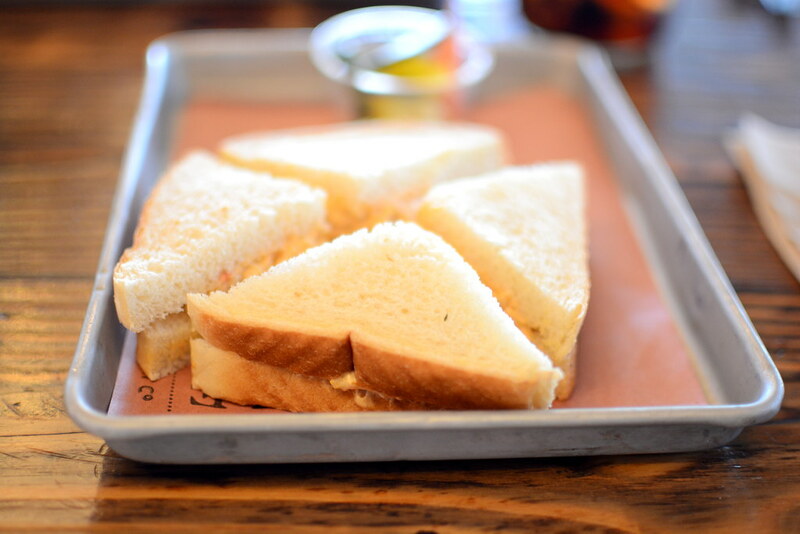 When it comes to comfort food, it’s hard to beat southern barbecue. I’ve been hearing nothing but terrific things about Chef Adam Cole’s Maple Block Meat Co. since it opened last August, particularly about the brisket. A weekday lunch with two friends meant that California’s “best” would finally be mine. 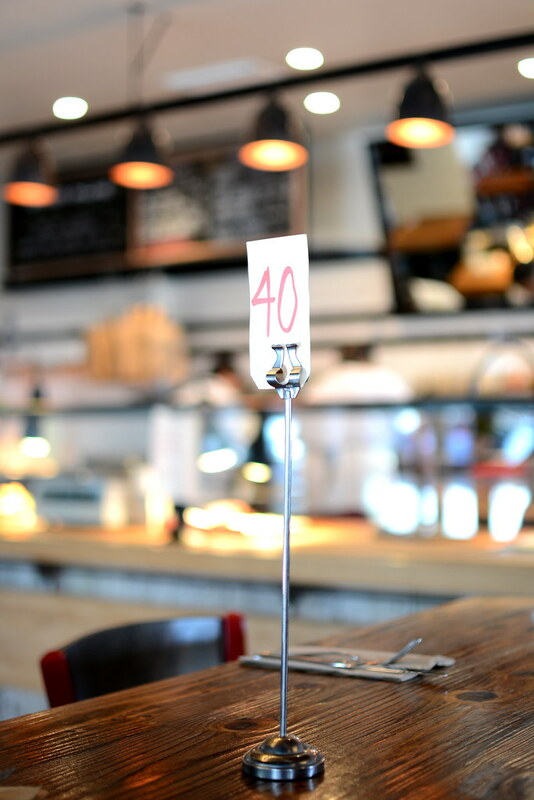 Interestingly, prior to smoking meats in Culver City, Chef Cole spent time in the kitchens of The Bazaar and ink. 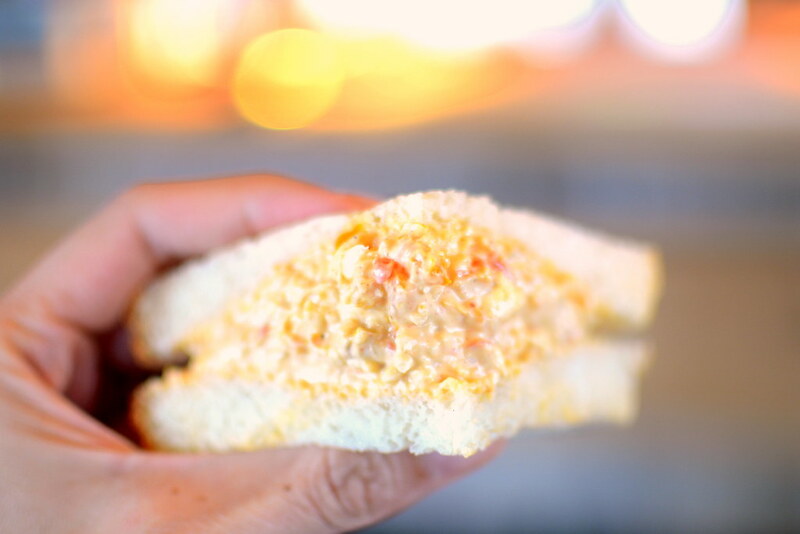 To start, the anchovy-spiked Pimiento Cheese Sandwich ($6) was calling my name. I have a penchant for pimiento, and this version, smooshed between two slices of white bread, was real good. For my main course, I indulged in a two-meat “plate” served with house-made pickles, barbecue sauce, and choice of two sides ($18). The protein portion of my platter consisted of a smoked sausage link and an impressively fatty slice of brisket. Both were deeply satisfying. 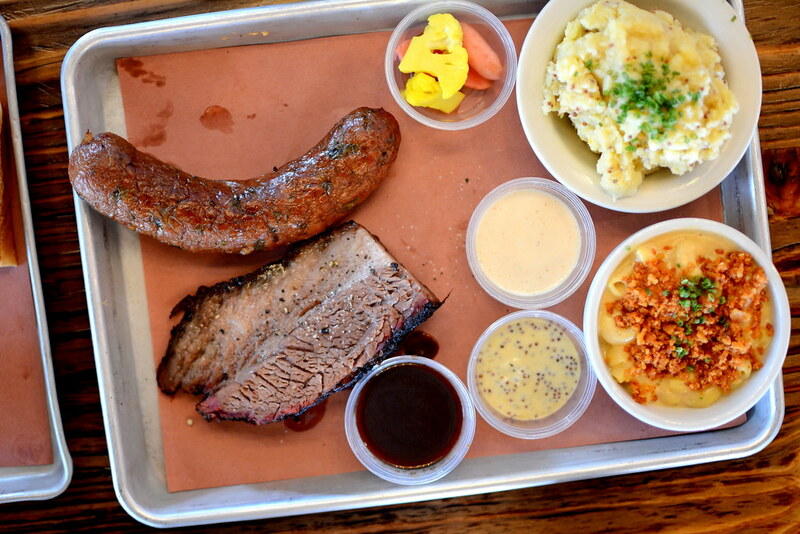 A trio of sauces, white, spicy, and mustard, weren’t really needed because the meats shined so brightly on their own. The sides, potato salad and mac and cheese, were good too. I favored the latter for its Yankee bite and crunchy topping. Mushy southern mac and cheese this was not. For dessert: cookies and more cookies. The bacon chocolate chips ($1.50) were quite possibly the smokiest thing we ate all afternoon—we couldn’t decided whether this was good or bad. 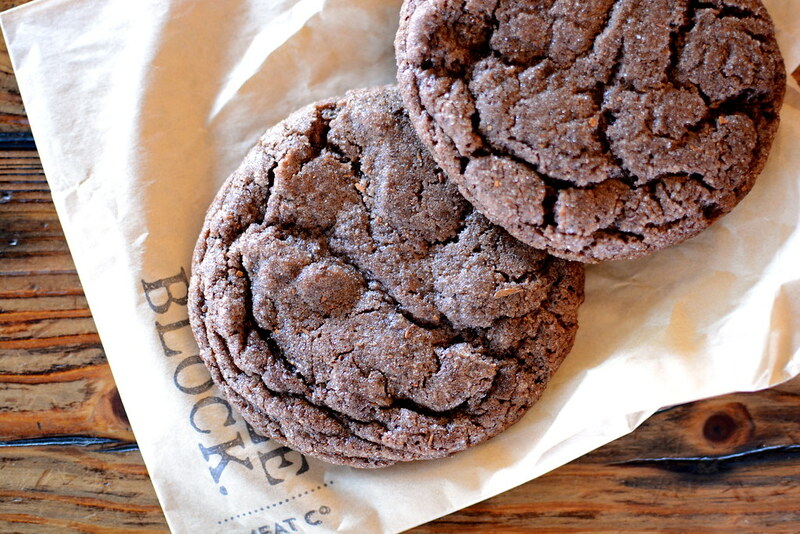 The chocolate snickerdoodles ($1.50), on the other hand, were universally adored. 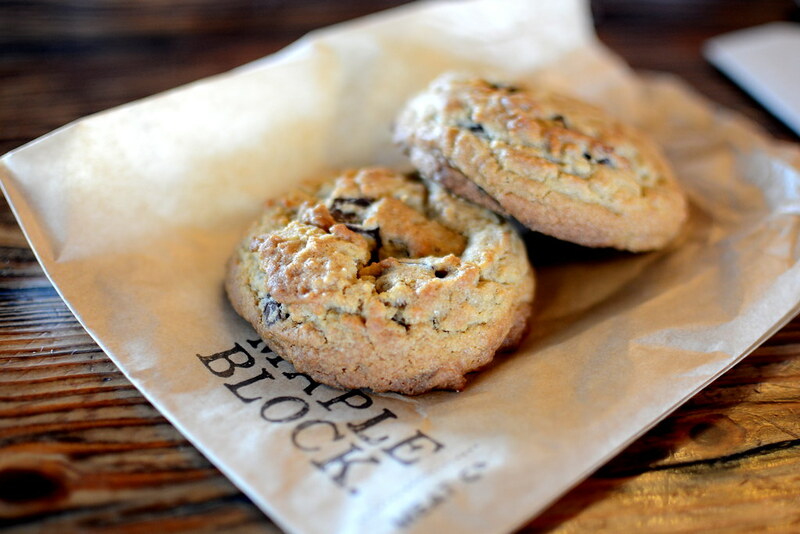 Crisp around the edges and moist throughout, these cookies were crowd pleasers. 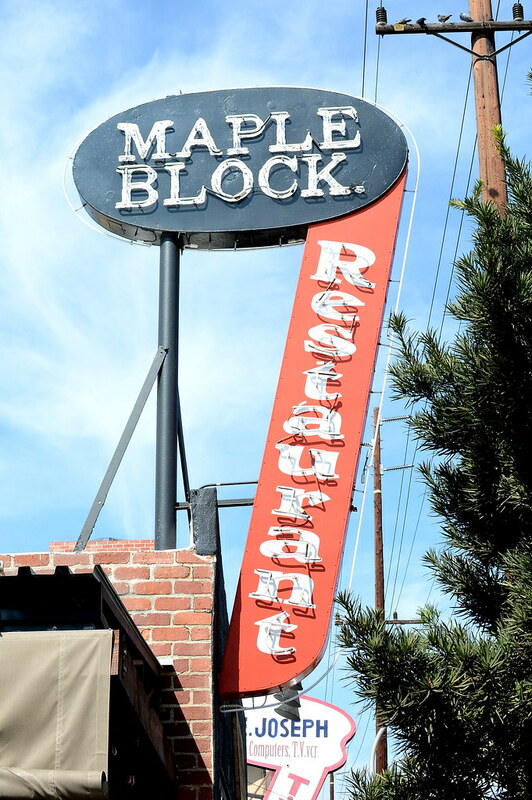 Lunch at Maple Block was as excellent as expected, and I look forward to dining here with my dear Astronomer the next time we’re in the neighborhood. He appreciates good ‘cue and can always be counted on to eat his feelings in solidarity. I know what you mean about eating your feelings. I have been baking healthy cookies to soothe my soul. what was up with the hacking…. Bad luck, at. I *hope* we’ve got it all figured out. Fingers crossed!